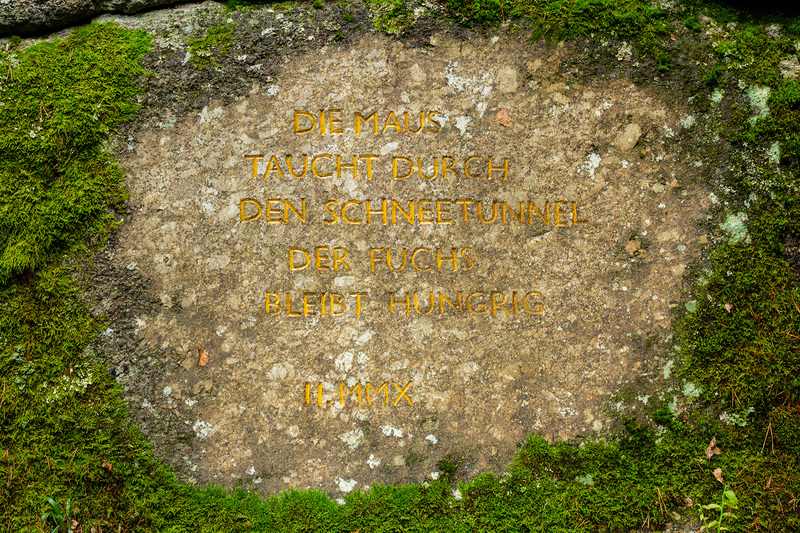 “Inscriptions for Wild Animals” is a Europe-wide project by Daniela Lipka and Hartmut Schnedl. It began in Austria and is scheduled to continue in other countries with inscriptions in English. We are currently looking for a cooperation partner in Estonia. 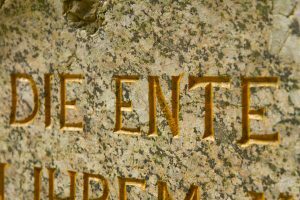 Stone inscriptions give witness to the special events in the lives of humans. With the Landart project “Inscriptions for Wild Animals” we would like to pay tribute to the wildlife. This could be insects, amphibians, mammals or birds. Visitors of a landscape therein receive an unusual perspective of animals living in the wild. The landscape also receives a new landmark for local nature enthusiasts and tourists. The project constitutes a new way of building consciousness for animals in nature. Upon authorization by the owner or respective nature conservation agency, we select two suitable granite stones, ideally near a hiking path so that they can later be discovered by passersby. For a few days, we then observe what animals reside near the stone and what they experience here. Based on these observations, we then reconstruct a special event that was of great significance to the life of that animal. In our project in the Austrian Waldviertel for the” Niederösterreichische Viertel Festival”, we found the remains of a pike in a stream. We found out that this pike had been flushed out of a fishing pond in a flood following heavy rainfall. The former ruler of the pond got stranded in a side stream, where he then became easy pretty for a hungry otter. We formulate this event in one or two sentences in dignified, compact language. at the stream, washed away from his pond. the gateway to new shores. In doing so, we single out one moment in the life of the animal. The readers of this inscription should thus receive food for thought: the landscape around them is full of animal comedy, romance, tragedy, luck, adventure, and misfortune—just as in human life. We then chisel out the short sentences with letters approximately 5 cm tall and paint them with environmentally friendly paint. 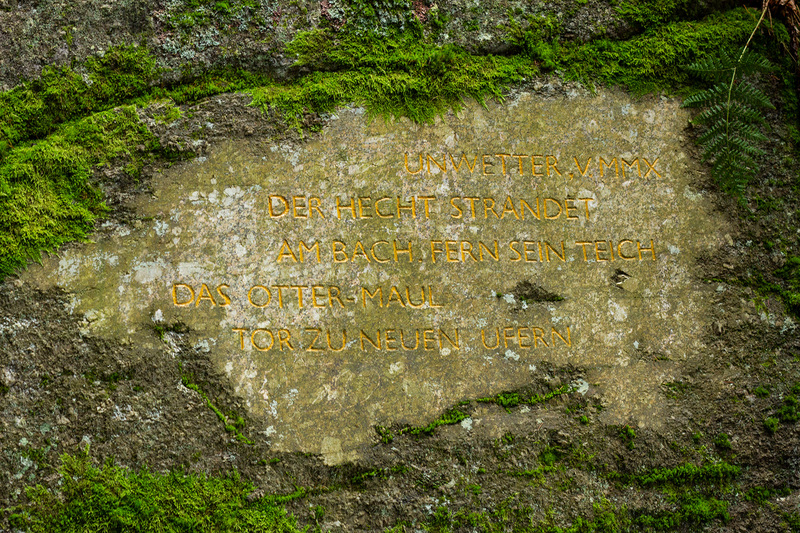 The inscriptions become a part of the landscape. New landmarks emerge, which are then consciously sought out by hikers (tourists) or which can be encountered by chance. The project constitutes a new way of building consciousness for animals in nature. The inscriptions are drawn up in English. The cooperation partner provides an array of suitable granite stones to choose from, and obtains the authorization for carving them. The surface should ideally be 1-2m high. Larger stones in the ground are also an option. The stones should be easily accessible and be located near a hiking trail. The final selection of two stones will be made by us. Implementation of the Landart project (3 weeks) in July or August 2019. Travel costs and board are taken care of by us. During the project, we are available for journalists’ inquiries and interviews. The copyright of the project remains with us for an indefinite period and the described project may only be carried out by us. The mentioning or advertising of the Landart project from the side of the cooperation partner always proceeds in the context of our names. Beyond that, we place no financial demands.